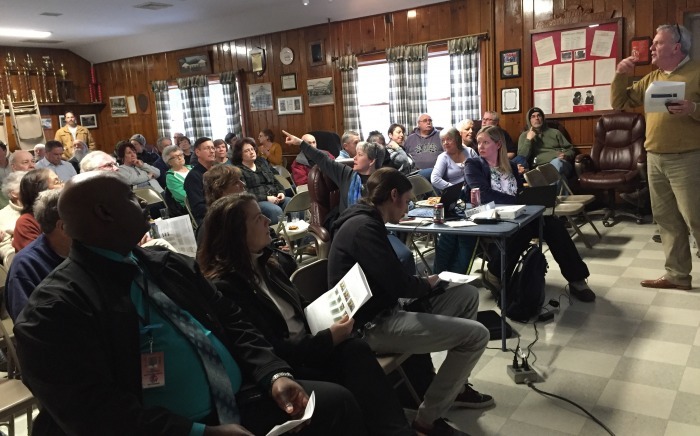 The Community Advisory Panel (CAP) met on March 9, 2017 at Slater Chemical Fire Hall. The meeting started in typical fashion – with a safety moment, site environmental update and key activities since the last meeting. CAP members were introduced to the concept of a design charrette. A design charrette is an intense period of design and planning, where citizens, designers and other interested parties collaborate on a vision for development. Chevron will be using this process, working with the CAP and the Town of Fishkill, as we begin planning the vision for the future of the former Beacon Research Center property. Members of the Chevron team that will help in facilitating the charrette were introduced and each discussed their role and scope of responsibilities. As part of the charrette process, a preliminary market study and current status of the site were presented. CAP members suggested that a micro version of the market study be created to reflect the unique business climate of the Beacon area. This ties in with Chevron’s overall goal is to create a place that reflects the unique qualities of the region and complements the character of the local community. The Chevron team agreed to incorporate this micro study into their analysis and will present it at a future CAP meeting.